Steel castings made by sand casting process always have some casting defects, such as shrinkage, sand inclusion, blowhole, porosity and cracks etc. In China, most of steel foundries, including Dandong Foundry, produce steel castings by manual method, and the cast sand needs better air permeability, and moreover, cast steel has larger shrink rate than cast iron. 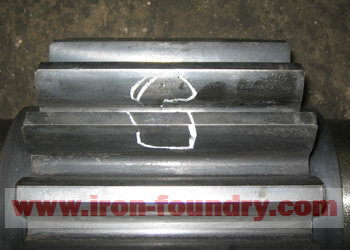 These factors cause cast steel has more defects. Shrinkage normally happens at the positions of gating system. Mainly because the hot liquid steel cools too quick, there is no enough steel water to compensate the shrink areas. Shrinkage have some different types, large shrinkage looks like irregular air holes, small shrinkage has many small pin holes, so this kind of shrinkage is also called as porosity. 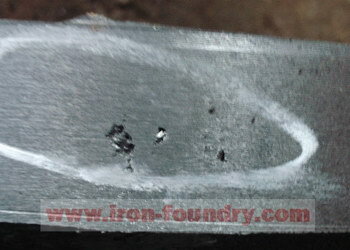 Sand inclusion is also very common defect. Sand grain easily fall off because of the flush of hot liquid steel during pouring process. Cast steel materials have some steel scraps, which has some aluminum components, so after chemical reaction, the generated gas will be held on the surfaces or inside. There are some different types of cracks, such as cold cracking, hot cracking, shrinkage crack, craze cracks, and heat treatment cracks. Cracks are fatal defects for steel castings, because they could seriously reduce the tensile strength of cast steel. The above cast steel defects on the surfaces of castings could be repaired by electric welding and cast steel repairing adhesive if they do not affect the application. The inside defects could be inspected by NDT testing methods, such as ultrasonic testing (UT) or magnetic particle test. However, the inside defects almost can not be repaired.